When it comes to treating depression, research shows the best approach includes a combination of counseling, psychotherapy and antidepressants. As a psychotherapist working in cancer centers for 20 years, I have often helped people who became clinically depressed during or after cancer treatment. I have listened to questions and concerns about antidepressants, and have learned a variety of reasons why cancer patients are reluctant to take this type of medication. Some people feel society condemns the use of antidepressants because they are associated with mental illness. Others express concerns about addiction and potential side effects, including thoughts of suicide. Medication and emotional support are usually effective in treating depression and its symptoms — but only if you choose to seek help. There currently is no research available about depression in mesothelioma patients. However, the National Cancer Institute (NCI) reports up to 25 percent of all cancer patients develop symptoms of clinical depression during or after treatment. Of these patients, only 16 percent take antidepressants to manage their symptoms. The NCI also explains that depression is an underdiagnosed condition, meaning it is likely more common than we realize. Part of the problem could be that people aren’t speaking up about their emotional health. Surveys of cancer patients indicate that some patients are reluctant to disclose symptoms of depression (sadness, lack of motivation, social isolation and tearfulness) to their primary care physician or oncologist. In addition, patients sometimes decide not to take antidepressants even after their doctor recommends and prescribes them. It’s ultimately up to you to decide which treatment recommendations to pursue, but it is important that you make an informed decision. Unfortunately, there are many misconceptions about antidepressants that stop people from getting the help they need. I’ve included some of the most common reasons cancer patients with depression told me for not wanting to take antidepressants, and how I addressed their concerns. The vast majority of cancer doctors are keenly aware of the prevalence of depression and the common emotional challenges that accompany a cancer diagnosis. You are not their first patient to experience depression, and you won’t be the last. Oncologists tend to focus on assessing physical symptoms such as pain, nausea and shortness of breath during a visit, but don’t be afraid to bring up your emotional or psychological symptoms. Because your doctor doesn’t specifically ask about your emotional health during your visit, it doesn’t mean your mental health isn’t relevant to your care. In fact, your mental health can affect your quality of life and ability to comply with treatment. Many studies since that time have found that antidepressants can be used safely. With close supervision by a counselor or physician, antidepressants are more likely to reduce suicide risk in the long run by improving mood. The bottom line is that when people are clinically depressed, they already have a higher incidence of suicidal thoughts, regardless of whether they are receiving any treatment or not. Antidepressants are not addicting like alcohol, nicotine or tranquilizers. Because antidepressants generally take four to six weeks to work, they do not provide an immediate feeling of happiness or calmness like most addictive drugs. You won’t need an increasingly higher dose of antidepressants during treatment to get the same effect, and you won’t crave them when treatment ends. To minimize side effects, doctors recommend you start taking antidepressants slowly at low doses. When it’s time for treatment to end, your doctor will advise you on how to slowly wean yourself off the medication to help prevent withdrawal symptoms, which may include nausea or insomnia. In the last several decades, the FDA has approved several new antidepressants as well as improved versions of older antidepressants. Most of the newer antidepressants come with fewer side effects and are as effective — or more effective — than older medications. Even if you’ve unsuccessfully tried antidepressants in the past, the fact is that many people have to try several medications before they find the one that works for them. It is understandably frustrating to be depressed and have to wait and see if a particular medication will work for you or if you will need to try another one. However, the vast majority of people ultimately find an antidepressant that works well for them. Antidepressant side effects vary by medication and not every patient experiences them. 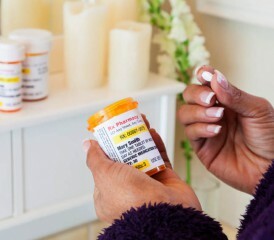 Overall, patients often say the benefits of being on antidepressants outweigh the side effects. The antidepressant drugs that doctors prescribed from the 1960s to the 1980s tended to have some challenging side effects like sedation, vision changes and constipation. In the late 1980s, however, Prozac emerged as the first antidepressant in a new class of drugs called SSRIs that generally have more tolerable side effects. Today’s popular antidepressants, including Effexor, Paxil, Zoloft and Prozac, have fewer side effects that usually subside after a few days of taking them. A symptom of clinical depression is negative thinking, which includes hopelessness and helplessness. This usually translates into thoughts like “Nothing will work to help me feel better, so why bother?” This type of thinking is part of the reason why depressed cancer patients tend to avoid reporting their symptoms and put off meeting with counselors or taking antidepressants their doctor prescribed. If you’re struggling with difficult emotions related to your cancer diagnosis, you should speak with your oncologist or primary care doctor about what’s bothering you. However, if patients are willing to bring up their mental health concerns and consider all treatment options available to them, they ultimately report feeling much better. Regardless of the reason why you’re hesitant to take antidepressants, starting a conversation about your mental health is the fastest way to figure out what’s wrong and start taking steps to fix the problem.